HOC2019 was such a great success! Can’t wait for #HOC2020. Let’s do this! Thank you so much for speaking at the Human Origins Conference 2019. HOC2019 was such a great success! All the speakers received their COAs tonight. Can’t wait for #HOC2020. Let’s do this! In terms of lifting the shroud of mystery, the veil of ignorance and the truth embargo on the paranormal, ufology, ancient astronauts, spiritual physics and our star born human origins, this article is quite apropos. Register now. Can’t be there? Problem solved. STREAM IT LIVE ANYWHERE! See you all this coming weekend. Visit http://humanoriginsconference.com and get your tickets or sign up for the live stream option. Visionary author Richard Smith will be speaking at Human Origins Conference 2019. The event is this Friday and Saturday. Revealing the fascinating realms of Earth’s cosmology, human origins, ancient history and lost wisdom, the Human Origins Conference carries a mission of sharing knowledge with the purpose of expanding the consciousness of humanity by presenting world-renowned researchers, writers and visionaries revealing such sensitive information. Sponsored by the Cydonia Institute, the New Mexico UFO and Paranormal Forum and the UFOteacher Global Initiative, the Human Origins Conference 2019 has an outstanding lineup of speakers including award-winning author and Master of Ceremonies Brad Olsen, History Channel’s Jim Vieira as seen on “Search for the Lost Giants”, NASA whistleblower Ken Johnston, Video Shaman’s spiritual journeyman Alexander Lipton, visionary author and experiencer Richard Smith, cutting-edge teacher and researcher Stephen Popiotek and Collective Frequency’s Anthony and Tammy Chino. Our keynote speaker will be the Cydonia Institute’s George J. Haas as seen on “Ancient Aliens” and “Beyond Belief with George Noory”. Visit the Speakers and Program sections for more information on each of our speakers and the conference schedule. Linda and Richard Smith are the executive directors of the Human Origins Conference, which has a prime directive that focuses on getting the word out regarding extraterrestrial intervention, alien contact, ancient history and the dynamic scope of our interstellar human origins here on Earth. The prime directive’s mission includes a special focus on economic, social and geopolitical issues affecting Earth’s ecology, spirituality, reincarnation, lost knowledge, ancient wisdom, linguistics and etymology, the human condition and current affairs, to name a few. Originally formed in 2011, the UFOteacher Global Initiative carries a strong global presence representing a cross-disciplined educational platform that the Human Origins Conference has been built upon. As an evolving network, the Initiative represents a collaboration of diverse interests throughout the world. The Initiative comes from a powerful economic worldview with an understanding that all things are connected, realizing that no one subject is isolated unto itself. When it comes to tackling controversial, sensitive, hot-button topics and issues, the Initiative exists to educate and empower the general public to take a stand against the social and economic constructs of human degradation in all aspects of our global society. In doing so, humanity is given a fighting chance to reclaim our ancestral dignity as well as our original legacy among the stars. We know this is a tall order and none of us live in an ivory tower. However, both the Initiative and the Human Origins Conference pursue the realistic perspective that the glass is still half full. As such, we maintain that it is everyone’s responsibility to stand up and do something to turn the tide so as to avert the unnecessary and inexcusable actions that have the potential of leading to our own extinction level event. Remember, you are the master of your own destiny, the captain of your own ship and the arbiter of your own fate. There is nothing that happens on this planet without our individual influence and universal connection. So, let’s get down to brass tacks and accomplish something wonderful together! Wouldn’t that be original? We think so. Welcome aboard! Linda and Richard Smith currently reside in Rio Rancho, New Mexico. They are the published authors of four books and have been speaking locally and internationally with author events, interviews, lectures and conferences. This event is organized by Richard and Linda Smith. Tickets are on sale now. Live streaming is available. Register now and get your conference tickets. Can’t be there? Problem solved. STREAM IT LIVE ANYWHERE! Nine Amazing Speakers – an unrivaled speaker line-up! Looking forward to seeing you all this coming weekend. HOC2019 $45 Early Bird Special for the LIVE streaming access link through March 9! Can’t attend the event? Problem solved! Visit http://humanoriginsconference.com and click on the obnoxious red oval. 9! Regular price is $85 after March 9.
and Saturday, when the conference goes LIVE! Only $85 for BOTH days to attend the conference in person! the entire complete Eventbrite address below into your web browser. This is a great option for people who wish to meet our amazing unrivaled line-up of Speakers and Presenters in person while visiting our dynamic Exhibitors and Vendors. In theory, putting liquid between Starship’s steel skin and the scorching-hot plasma generated while it plows through atmospheric gases would prevent the ship’s destruction. Science has the power to change the world, but it’s not always an easy path to enlightenment. At many junctures throughout history, proponents of revolutionary ideas have come up against criticism and pushback from the establishment. All the war, conflict, and misery that has beset civilization for centuries and longer may lead you to think human society is tragically defined by a constant clash of irreconcilable cultures. Not so, according to a new study, which in fact found startling and optimistic evidence to the contrary: all cultures are actually bound by a common moral code of seven distinct shared rules and behaviors. HEADS UP! My newest book, “The Moor, The Mason And The Alien Part II: A Vril Manifesto”, has been reviewed by Phenomena Magazine. It will be published in the upcoming January 2019 edition of the magazine. Remember, this book series makes a great gift for the holidays. “This is a remarkable work. Simultaneously apocalyptic and subversive, it’s a bit like what a space-age Che Guevara on acid might have produced. This author does not take prisoners either and the body count steadily mounts as he gets his revolutionary message across. At some points in the text, it is difficult to decide if this is a work of fiction or not, because it can be taken that way, but it soon becomes clear that it is very much rooted in reality. The book pretty much takes up where the first one left off, but this time using the concept of ‘Vril’ (the book is subtitled ‘A Vril Manifesto’) to get his point across. This is a bit risky given the unfortunate connection between Nazi occultism and Vril as a near-limitless source of power. In fact, on page 66 the author talks about ‘Repto-Sirian Fascism’ and Vril in the same paragraph, but this a not what the book is about, far from it. What’s more, the book is packed with refreshing broad humour and one example of this crops up on page 65 under, ‘Our FUBAR definition’. Just in case you do not recognize what this military acronym means, it stands for ‘F***ed Up Beyond All Recognition’ and it raised a smile on the face of this reviewer. Remember, this book series makes a great gift for the holidays. Visit http://book.ufoteacher.com today. 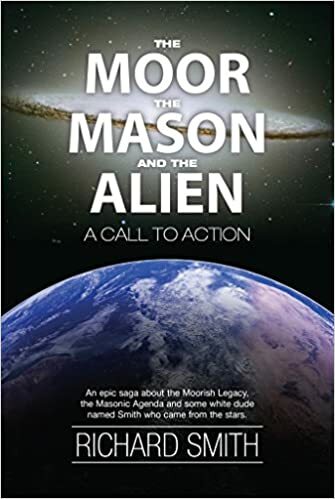 Use the search phrase “moor mason alien” on Amazon and BN.com. A special shout out goes to my family, friends and business associates for your time, effort and interest. None of this would be happening without your support and consideration. It is beyond words and much appreciated. “Our problem is a society that is unintentionally, but actively, ignoring opportunities because of the cultural perception of wildfire,” said Jack Cohen, who is retired from the U.S. Forest Service where he worked for 40 years as a fire research scientist.